With the Malaysian 14th General Election (GE14) set to be held by August this year, local pollsters like Merdeka Center and Politweet have been releasing results on the chances of the two main political coalitions, Barisan Nasional (BN) and Pakatan Harapan (PH), winning the coming election. Both of the polls, however, are focused on three-cornered fights that involved a third political force in Malaysian politics, the Pan-Malaysian Islamic Party (PAS). In their surveys, the two polling agencies are confident that the three-pronged contests in the coming election will deliver victory to the ruling BN. Generally speaking, these poll results are not wrong, but political scenarios at the grassroots level are bound to local factors that may not be reflected in the quantitative studies as done by national pollsters. We are seeing the significant rise of localization of electoral politics in Malaysia today — a phenomenon that started after the watershed election in 2008 and has accelerated in the run-up to the GE14 this year. There are two factors in this localization process. The first is the “Mahathir factor.” Dr. Mahathir Mohamad was recently named as the opposition pact’s prime minister-designate, pitting him against the incumbent Prime Minister Najib Razak. Mahathir’s personal appeal to the northern state of Kedah is a huge impediment to the ruling coalition’s continuous rule in the state. Kedah has been Mahathir’s political base since his early days in politics in the 1950s. It is expected that he would bring his influence in Kedah with him into his new party, Parti Pribumi Bersatu Malaysia (PPBM), which eventually joined the opposition PH late last year. Being the figure responsible for bringing development to the state during his prime ministership from 1981 to 2003, the prevailing sentiments for the former Malaysian leader among Kedah locals should not be overlooked. 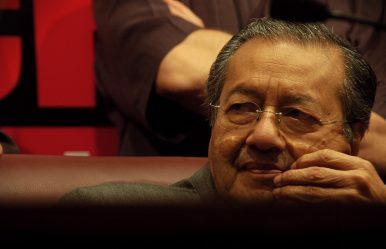 For one, the revelation that Mahathir would contest in one of the two constituencies in Kedah is poised to resonate with nostalgic feelings among the locals, especially the Malay voters who identify him as the “father of the state.” Even a delegate of the United Malays National Organization (UMNO) admitted that the “Mahathir factor” has made it difficult for the main ruling party to mobilize locals in the state to support the BN coalition in the coming GE14. Also, the interrupted chief ministership of his son, Mukhriz Mahathir, is another basis the opposition PH is using to draw sympathy from Kedah voters. With Mukhriz tipped to be the chief minister again if the coalition wins the state in the GE14, it is likely to capture the imagination of Kedah voters — the return of his son to power is seen as a continuation of Mahathir’s legacy in the northern state. However, with Kedah voters changing two state governments in 2008 and 2013, the state itself is largely a marginal state to begin with. The second important factor is the proliferation of former UMNO leaders who are now confronting the ruling party as influential opposition figures, following their fallouts with Prime Minister Najib on the 1MDB issue in 2016. Former Deputy Prime Minister Muhyiddin Yassin, for example, is seeking to utilize his political base in the northern part of Johor state as a springboard to capture the state with his new political allies in the opposition alliance. Whilst prominent analyst Wan Saiful deemed such an endeavor as a difficult task, with a majority of Malay voters still pledging their future to the ruling UMNO in the state, the PH’s latest move is a demonstration of the localization of electoral politics. Whether this will lead the opposition to take their targeted 15 parliamentary seats in Johor, which the ruling BN won marginally in the 2013 election, will depend on their relative capacities to outweigh each other through effective utilization of local issues, native personality appeals, and robust campaigning in that particular state. There is also the popularity of Shafie Apdal to consider. Shafie, another former UMNO leader, seeks to exploit his support base in the eastern part of Sabah to make momentous inroads in the East Malaysia state. But unlike other states in peninsular Malaysia, Sabah’s case is a classic example of how a local agenda can dominate electoral politics between the ruling BN and the innumerable local-based opposition parties. By fostering a single identity among Sabahans and pledging to restore the state’s long overdue special rights (through activation of the Malaysian Agreement 1963, should it come to power after the GE14), Shafie’s newly-formed Parti Warisan Sabah (Sabah Heritage Party) is giving an appealing localist option to locals, as opposed to the ruling BN and its national opposition counterparts. In all, Sabahan electoral politics display an exceptional presence of localist politics, unlike the states of Kedah and Johor. Unlike the last two elections, the coming general election will feature a localization of electoral politics unseen in Malaysian political history. This is made possible through the departures of the former prime minister and UMNO leaders whose political bases came from their respective states. The questions that remain are: How much will PAS be able to disperse the votes from the two main political coalitions in these three battleground states and become the “king-maker” that they espoused to be? And will the voters of these states choose differently between the state-level and the parliamentary-level? All these questions will be answered in the battle for localities between the two main political divides. The side that achieves the most relative gains in these three battleground states will emerge as the eventual winner. Karl C.L. Lee is Ph.D. Candidate at the School of Arts and Social Sciences, Monash University (Malaysia Campus) and Visiting Senior Scholar at the School of Politics and Public Administration, Guangxi University for Nationalities (GXUN). S.K. Chia is Researcher in Anbound Malaysia, a Malaysian subsidiary of the leading private think tank Anbound China in Beijing.